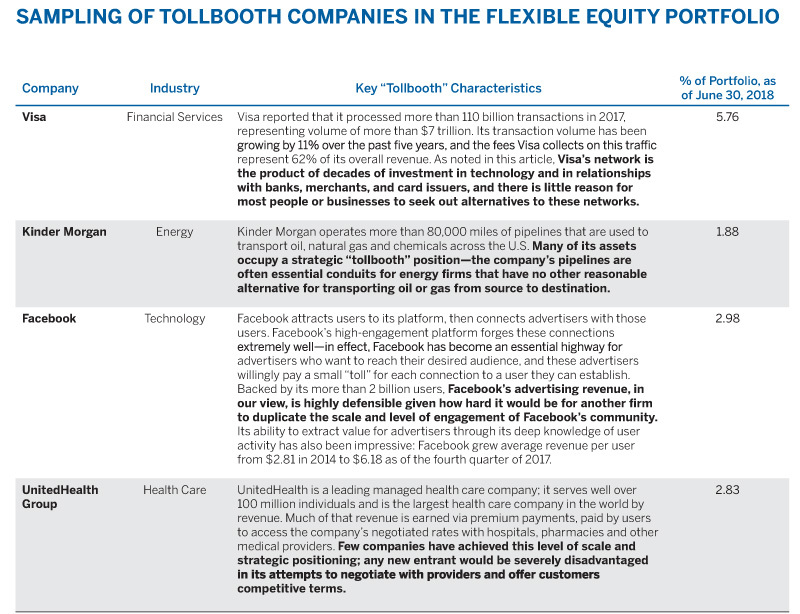 The Flexible Equity Strategy’s Maneesh Bajaj discusses the power of “tollbooth” business models and how they fit into the strategy’s overall philosophy of seeking out durable companies with attractive economics. This approach to finding companies with staying power has helped Flexible Equity outperform notably over its 30-year history and during the recent period as Maneesh has partnered with Hutch Vernon in managing the strategy. Most of us experience tollbooths (or the modern automated equivalents) as a simple, unavoidable fact of life. If there is a clearly superior route to get from point A to point B, we take it—and if there is a small toll charged for that route, we most likely pay the toll rather than choose an inferior route. The operator of the toll system, meanwhile, is in a highly enviable position—it can simply sit back and enjoy the reward of its strategically advantageous position. This concept has been a powerful strategic metaphor over the years for investors like Warren Buffett and others who focus heavily on finding business models with distinct and sustainable advantages. In managing the Flexible Equity Strategy, my partner, Hutch Vernon, and I are highly attracted to “tollbooth companies” that collect steady streams of revenue via excellent strategic positioning, durable competitive advantages and high barriers to entry that prevent new participants from dislodging them. Source: FactSet. The portfolio information provided is based on a representative Brown Advisory Flexible Equity account as of 06/30/2018 and is provided as supplemental information. Composite performance is based on the Brown Advisory Institutional Flexible Equity Composite, managed by Brown Advisory Institutional. Brown Advisory Institutional is a division of Brown Advisory LLC and Brown Advisory Institutional is a GIPS compliant firm. Returns greater than one year are annualized. Past performance is not indicative of future results. Please see the Brown Advisory Institutional Flexible Equity Composite performance disclosure on the back cover for additional information and a complete list of terms and definitions. We are long-term investors, so for us, buying a stock is equivalent to buying a business. Companies with these tollbooth characteristics have the potential to generate attractive and reliable cash flows for shareholders for very long periods of time. Over the years, we have found these opportunities in many different industry sectors, from financial services to health care to technology. As of June 30, 2018, these companies represented over 30% of our portfolio. Not every company can pull off a winning tollbooth business model. Broadly speaking, there are three key elements to such models if they are to succeed. Small, incremental collections: A tollbooth business generally collects a small sliver of an industry’s economic activity. These small tolls or charges, while modest individually, can add up incrementally to a meaningful total. Less attractive alternatives: There is a stickiness to these business models. Building a new road as an alternative to an existing toll road, for example, is often futile given prohibitive costs and resources. Drivers or customers are less inclined to seek alternative routes and are willing to pay a small amount to access a system or toll road that provides them the most efficient route. Pricing and scale flexibility: The tollbooth operator benefits from pricing power and minimal capital requirements. Further, if the capital requirements for supporting incremental traffic and maintenance are not high, this would be an attractive recipe for wealth generation over time. When all of these conditions are met and a tollbooth business has a strong grip on a high-volume market, it is often in a good position to generate attractive returns on capital for an extended period. Visa and Mastercard are wonderful business models with tollbooth-like characteristics. They have created competing namesake payment networks that connect merchants, cardholders, banks, card issuers and other institutions that sign up merchants to join their networks. These payment networks facilitate electronic fund transfers throughout the world. Visa and Mastercard charge a small “toll” (interchange) for the electronic transactions that ride on their networks. In return, they provide an important service of securely transferring payment information as well as clearing and settling payments. The two companies dominate the global payment-processing systems market. Global card purchase volume (excluding China) reached $13 trillion in 2017, according to the World Bank; Visa reported that $7.3 trillion flowed across its network, and Mastercard reported $3.8 trillion in volume, so collectively they own more than 85% of the market. As early movers and dominant players, the two companies combined have attracted more than two billion consumers and more than 40 million merchants to their networks, so both companies now benefit from enormous scale advantages. As mentioned above, trillions of dollars flow over these network “highways” every year, with minimal incremental investment required from Visa or Mastercard. The barriers for new entrants are extremely high—to compete effectively would require decades of investment in technology and marketing to attract consumers, merchants and banks, so there is little incentive for competitors to try to replicate these networks. With strong moats of protection and high returns on capital, Visa and Mastercard are prime examples of tollbooth businesses. The factors discussed above helped drive our decision to invest in both companies early, at the time of their initial public offerings. The investments in Visa and Mastercard have both had meaningful contributions to our returns over several years of our holding periods. The U.S. managed health care sector is an attractive industry in which leaders have benefited from a tollbooth position that sits astride continually rising health care spending. While many other countries operate single-payer public health care systems, about 90% of the U.S. population manages its health care costs through an insurance plan—primarily through the government (Medicare and Medicaid) or through employers, who all generally contract with health insurers to administer the plans. Insurers have created constrained networks of medical providers and negotiated lower rates for services from those providers. The providers benefit from the volume provided by the network, and the participants benefit from the lower cost of care. In other words, the insurers act as metaphorical tollbooth operators for health care. The only alternative to bypassing these “tolls” (which come in the form of annual or monthly premiums) is to pay the full cost of health care. While a commuter might seek an alternate route to avoid a toll, very few people will choose to pay full price at the doctor’s office in order to avoid participating in a health plan. In the modern health care system, with its evolving standards of care, new drugs in the marketplace, higher drug prices and overall skyrocketing costs, scale is a huge advantage for U.S. insurers. The biggest insurers have the most leverage in negotiating prices with providers, and they can also spread heavy fixed spending on technology and other areas across their millions of participants. Over the years, leading managed care companies like UnitedHealth, Anthem and Aetna have built that kind of scale, cementing their leadership positions with favorable relationships with care providers, pharmacies, and suppliers of medical supplies and devices. At this stage of the industry’s evolution, building a similar network from scratch, and the infrastructure to serve it, would be next to impossible within a time frame that would make the investment attractive. 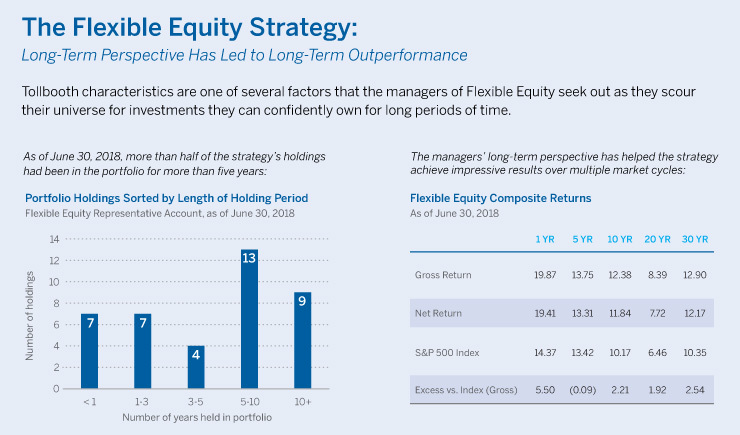 Managed care companies comprise approximately 5% of the Flexible Equity portfolio. Tollbooth characteristics and rising health care costs are big drivers of our investment thesis in these companies. We invested in UnitedHealth in the third quarter of 2017, which we especially like due to its superior use of data to drive better patient outcomes. Given positive industry tailwinds in the form of rising health care spending, we think firms like UnitedHealth can be attractive long-term holdings for the foreseeable future. Physical tollbooths are being replaced by more modern technologies, but in business, the tollbooth concept is still very much alive. In fact, technology trends are opening up more opportunities for these businesses, from mobile payment systems to social media advertising. For enterprise owners and investors, we believe that tollbooth companies will be attractive business models that can generate high capital returns over long periods of time. Earnings Guidance: Really Helpful, or a Red Herring?